Nia Vardalos arrives at the premiere of My Big Fat Greek Wedding 2 on Tuesday (March 15) in New York City. The 53-year-old star was joined on the Windex blue carpet by the movie’s producer Tom Hanks and his wife Rita Wilson, who also appeared in the movie. Also at the premiere were the movie’s stars Joey Fatone, Andrea Martin, Lainie Kazan, Michael Constantine, Alex Wolff and Elena Kampouris, along with Elaine Hendrix and Elizabeth Gillies. FYI: Nia is wearing a Christian Siriano dress. Anna Kendrick and Brittany Snow pose with a killer monster at the opening night of CreepLA on Tuesday (October 6) in Los Angeles. Also in attendance at the spook-tacular event were former Revenge co-stars Ashley Madekwe, Josh Bowman, and Connor Paolo, *NSYNC‘s Joey Fatone, Emmanuelle Chriqui and boyfriend Adrian Bellani, The Struts bassist Jed Elliot, actor Brock Kelly, and more! 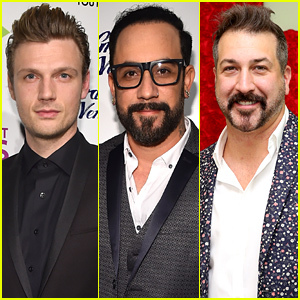 Backstreet Boys & 'NSYNC to Unite for a Zombie Movie! Backstreet Boys‘ Nick Carter is bringing together the BSBs and ‘NSYNC for a Syfy channel movie called Dead 7! The 35-year-old entertainer will write and direct the film, and has cast fellow Backstreet Boy AJ McLean and ‘NSYNC‘s Joey Fatone. Not only that – but Nick wants a One Directioner involved as well! “Ok @NiallOfficial I know we’re from different generations but…would you like to play my brother in this zombie movie with me?” Nick tweeted to Niall Horan about being in the movie.